One of the most enjoyable aspects, I’ve discovered, of writing about food that inspires you, is the added dimension of seasonality. Wild food especially, affords you the chance to inject a huge amount of enthusiasm into a subject, knowing full well that the time frame for its enjoyment is potentially limited. 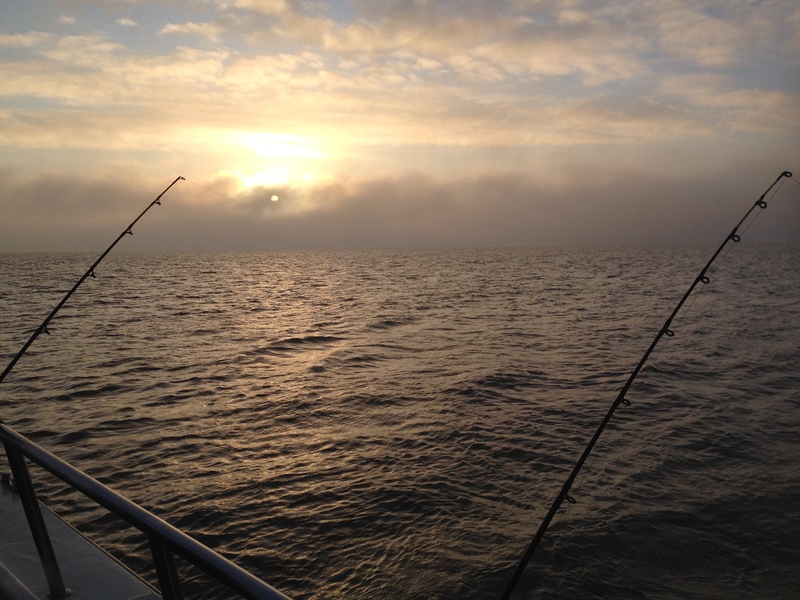 In our local Suffolk waters of the North Sea, we presently have an inundation, a teeming and flashing abundance of a fish that, as far as I can make out, few people locally are either interested in or let alone desire on their plate. Last week, whilst trying to hunt down a few Cod in Sole Bay, just off the coast at Southwold, I experienced, first hand, just what a profusion of this relatively diminutive member of our Pelagic species there is. On occasion during the trip, I witnessed their antics as they swam excitedly up against the tide so close to the surface that they broke the water, flipping momentarily free of the sea’s clutches. A distinct lack of Cod! Of course I’m referring to the humble Sprat (Sprattus sprattus) belonging to the Clupeidae family which has been caught in vast numbers around our coastline along with Herring and Pilchards for centuries. The Sprat is a small, oily, bait fish; gregarious, constantly swimming and continuously preyed upon by larger fish species, marine mammals and seabirds alike. Shoaling in dense packs alongside other pelagic fish, it moves into our shallower waters over the winter months competing with Herring for the same food sources i.e. plankton. It shares roughly the same nutritional characteristics as the other Clupeidae and so naturally has flesh that has a high polyunsaturated fat content (about 12%). 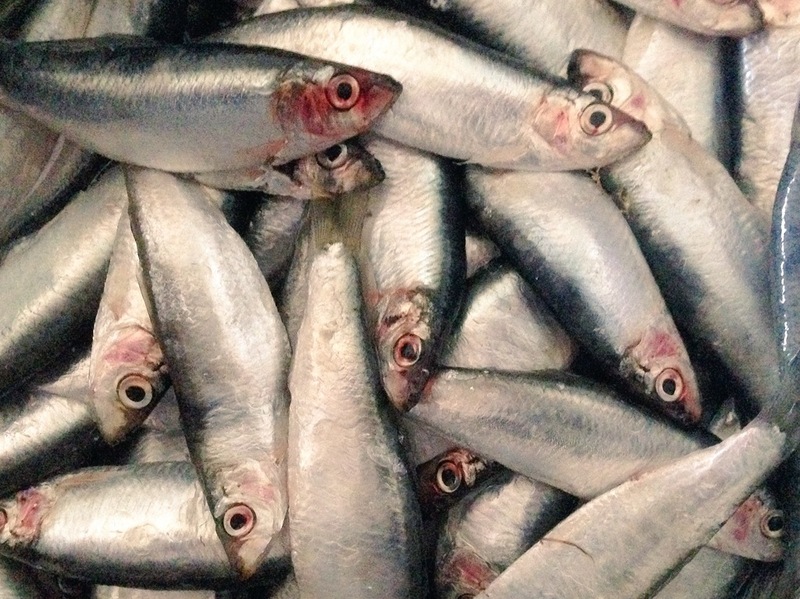 They are caught in the same way too, generally with drift nets and the catches, once landed, have traditionally been either canned or salted, young canned sprats often being referred to as Brislings. Their flavour, I believe, is exceptional and in my opinion, if you like Whitebait, – a generic term for fry of the Clupeidae family, then Sprats are just a natural progression onto a slightly larger version. Fried, deep-fried, grilled, smoked, soused or sashimied the Sprat presents an opportunity for not only a highly flavoursome and nutritious meal, but an incredibly cost-effective dish, which arguably could assist in the effective management of many a household budget, as the cheapness, coupled with the noticeable lack of preparation time, means that the nutritional value delivered makes it massively economic to use. I just love them and I thought I’d share my favourite recipe for them here, which is to have them Devilled, served with a few comforting chunks of freshly home-baked bread or indeed atop the same, but toasted, and with an obligatory lashing of butter. Armed with a delivery of our fresh local beauties, from Chris, here is lunch. There are several recipes about, but only really variations on a theme. This is my take on it. 1 lb (0.5 kg ish) Sprats (or as many as you think you can manage) Gutted and heads/tails off. Tip: insert your knife just behind the head and then nip off using thumb and forefinger the guts will follow, leaving the roes behind! Combine all the ingredients for the sauce in a small pan and warm through before tasting. Add a little extra of anything to bring it up to your own satisfaction if you feel it’s lacking. Keep the sauce warm prior to serving. Roll the cleaned sprats in the flour mixture and dust off any excess. Whip them in under the heat until the skin bubbles up, then turn them over and repeat. 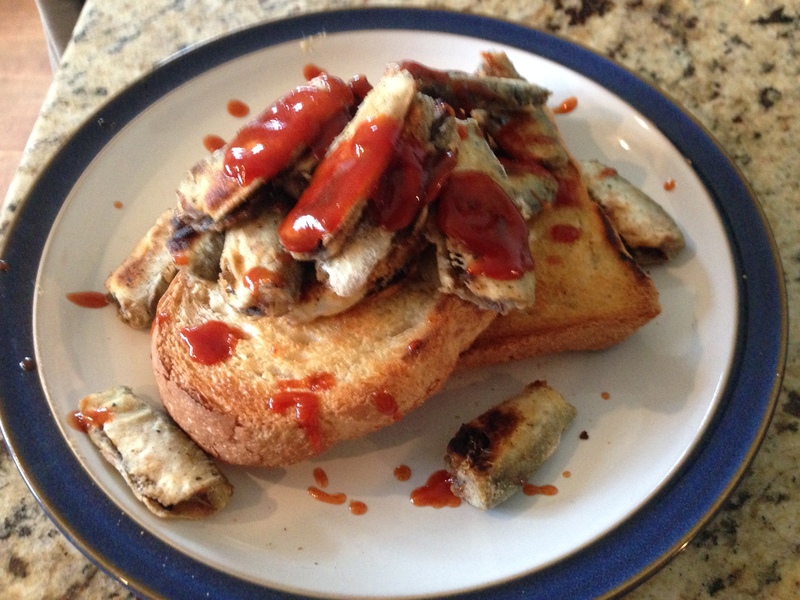 Serve the sprats atop the toast and drizzle with the sauce. Devilled Sprats to me are one of those quick, sublimely flavoursome and deeply satisfying dishes that I defy anyone who tries them, not to instantly succumb to smiling. A simple, indulgent and wholly assuaging meal that leaves you feeling profoundly replete. Seasonal and sustainable satisfaction. So, going back to the start, it’s really no surprise that I didn’t land any Cod last week. After all, with such a plenitude of some of the most delectable prey swimming all around you, who would be tempted by a lugworm or a strip of squid, when you can spend all day hoovering up Sprats? I can’t say I blame them. Previous Post Is there a Catch?